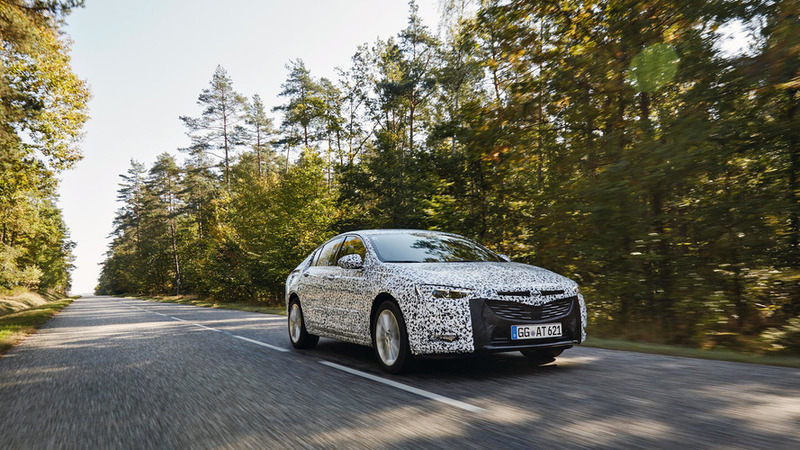 The next-gen Opel Insignia Grand Sport doesn’t debut until the Geneva Motor Show in March 2017, but the German automaker is already turning up the heat on the teaser campaign for its upcoming liftback sedan. The company recently took one to the Nürburgring Nordschleife for fine-tuning the high-tech suspension system. The Insignia Grand Sport boasts the latest version of Opel’s FlexRide adaptive chassis system, and the company claims the tech gives the model sharper handling. The components include new speed-dependent steering, and the dampers can read the road 500 times per second for adjustments according to the mode that the driver selects. The Sport setting makes the steering and suspension firmer, improves throttle response, and holds gears longer before shifting. Touring maximizes fuel economy and softens the ride for easier cruising. Standard sits in the middle, and the system changes based on a person’s inputs. For example, if someone chucks the Insignia into a corner, FlexRide immediately assumes a more aggressive demeanor for taking the turn. Opel has other upgrades for the new Insignia that should improve handling, too. The new model is 386 pounds (175 kilograms) lighter than the outgoing one. In addition, the wheelbase is 3.6 inches longer (92 millimeters), but overall length jumps 2.1 inches (55 mm). Inside, the company drops the driver's seating position by 1.2 inches (3 centimeters) and positions the controls for easy viewing. The regular Insignia powertrain range will reportedly include a range of three- and four-cylinder turbocharged engines. There’ll also be a new 160-horsepower (118-kilowatt) biturbo diesel, and the Holden-badged version for Australia will be available with a naturally aspirated 3.6-liter V6 making 308 horsepower (230 kilowatts) and 273 pound-feet (370 Newton-meters) A high-performance OPC variant will also allegedly get power from a turbocharged six-cylinder. Most of the Insignia’s powerplants will send the output to the front wheels, but customers will be able to order some with all-wheel drive, too. While it’s still camouflaged, there are obvious cues from the Monza concept in the Insignia Grand Sport’s front end, especially the sharp-edged headlights. The sloping roof appears to take inspiration from four-door coupes but without being so extreme as to compromise headroom for occupants in the rear seats. Spy shots show that Opel is currently developing a new Insignia Sports Tourer wagon, too. The model dumps the swoopy rear in favor of a seemingly massive cargo area that looks capable of swallowing quite a lot of stuff. Rüsselsheim. 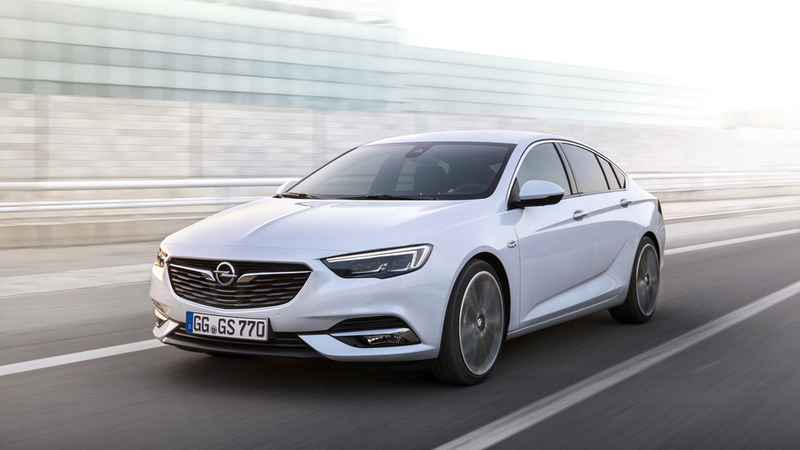 Opel has given the Insignia Grand Sports everything a middle class sedan requires to ensure improved vehicles dynamics and a more agile drive. The newcomer has shed up to 175 kilograms compared to the outgoing models, which obviously benefits both the handling and the driving performance. The athlete is 29 millimeters flatter than its predecessor, the track has been increased by 11 millimeters, the overhangs have been reduced considerably and the wheelbase extended by 92 millimeters – this provides additional directional stability at high speeds. The further refined FlexRide chassis adapts dampers, steering and propulsion automatically or via the selectable ‘Standard’, ‘Sport’ and ‘Tour’ modes. This can best be put to the test on the legendary Nordschleife of the Nürburgring. The circuit is extremely challenging with its changing surfaces, straights and corner combinations. Every new Opel is put through its final paces here. 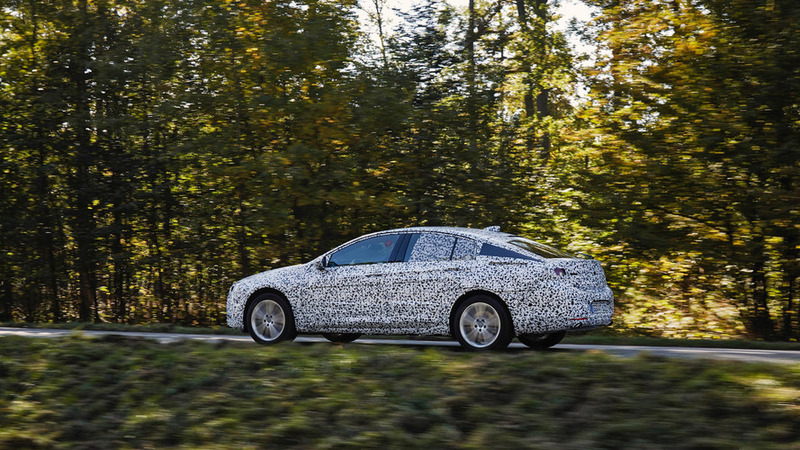 The team around Insignia chief engineer Andreas Zipser travelled to the test-drives on the Nürburgring with camouflaged prototypes. And the engineers the 21-kilometer long Nordschleife to search for the final percentage points en route to a perfectly tuned vehicle. “You can feel that the Insignia has been developed from a white sheet of paper as soon as you get into the car. The integration of the driver is outstanding and this provides a much better feel for the car. The Insignia has become much more agile, even with the same engine,” said Zipser who is already looking forward to the next fast laps. The chief engineer heads out of the paddock and takes the Insignia Grand Sport onto the Nordschleife. He soon pushes the 5-door sedan to its limits, dives into the course section known as “Brünnchen” before skillfully mastering the “Pflanzgarten” – a section famous amongst motor sports fans. Opel’s new flagship is driving fast. Zipser enjoys the new, precise, speed-dependent steering and the position in the driver-oriented cockpit. The driver’s position is three centimeters lower than in the outgoing model and creates a feeling of actually being part of the car – the center console provides addition support, the instruments face the driver and all controls can easily be reached. All this results in a position similar to the one provided in a racing touring car and is ideal for a dynamic outing – not only on the Nürburgring. For such a dynamic outing, the driver should ideally select the ‘Sport’ mode of the FlexRide chassis: The dampers are stiffened, the steering and throttle response are more direct. Furthermore, the ESP anti-skid system intervenes later, thus give the driver more leeway. In combination with an automatic transmission, the ‘Sport’ mode shifts up through the gears later – the Insignia is completely set-up for dynamic driving. ‘Standard’: The automatic control selects the best set-up based on the information collected by the vehicle sensors. ‘Tour’: Comfortable chassis configuration, propulsion settings for favorably consumption – the right mode for relaxing long-distance drives. 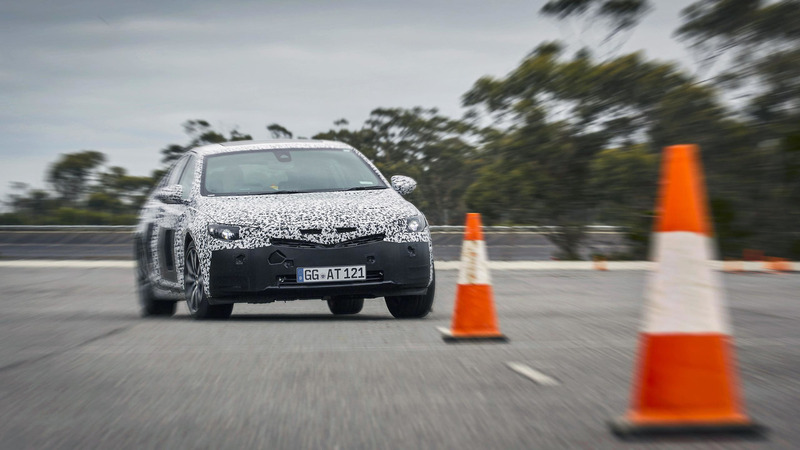 ‘Sport’: Brake dive is reduced, the chassis angles considerably less when cornering at high speeds and the steering provides more direct feedback on the road conditions. The FlexRide chassis electro hydraulically adapts the dampers to the road and the prevailing driving situation 500 times per second or 30,000 times per minutes. Furthermore, the driver can save personal preferences for the steering characteristics, throttle response and dampers via the ‘Sport’ button. “The new central ‘Drive Mode Control’ software is the heart and soul of the adaptive chassis. It continuously analyzes the information provided by the sensors and setting and recognizes the individual driving style. The individual systems are then optimized for the best traction and road position,” explained Zipser. If, for example, the Opel Insignia Grand Sport is driving along in ‘Standard’ mode and the driver decides to attack the corners on a winding road with a bit more vigor, the software recognizes the more dynamic style based on the acceleration and braking value and immediately switches the chassis and propulsion components to sporty.